Every year, more than 18 million people choose Cover-More worldwide. Formerly known as Travelsure, Cover-More Travel Insurance has been providing travellers in New Zealand with high-quality travel insurance cover and round-the clock customer service for many years. Although we manage millions of policies and thousands of claims each year, we treat each customer with the individual care they deserve. All our customers have access to 24 hour emergency assistance regardless of where they are in the world. Cover-More Group was acquired by Zurich Insurance Group in April 2017 and Zurich Australian Insurance Limited trading as Zurich New Zealand, will become Cover-More’s underwriter in New Zealand from 1 June 2017. Zurich is one of the world’s leading multi-line insurers with about 54,000 employees. The group provides property and casualty, and life insurance products and services in more than 210 countries and territories. Zurich’s customers include individuals, small businesses and mid-sized and large companies, as well as multinational corporations. An insurance company's financial strength can be defined as the company's claims paying ability, that is, its ability to meet its obligations towards customers. 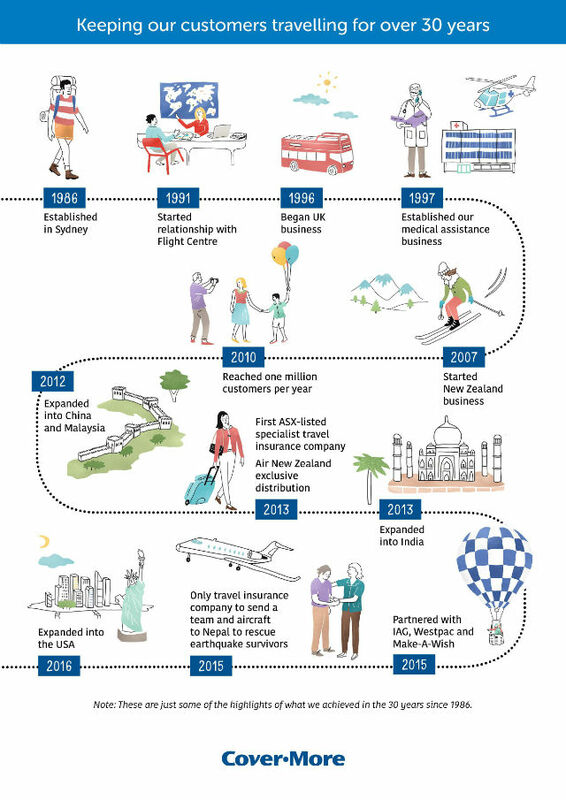 In New Zealand, Zurich’s general insurance products are underwritten by Zurich Australian Insurance Limited (ZAIL), trading as Zurich New Zealand. Further information on these ratings is also available from www.standardandpoors.com. Cover-More supports Make-A-Wish children and their families in facilitating their wishes, by providing travel insurance for their overseas trip organized by the team at Make-A-Wish. 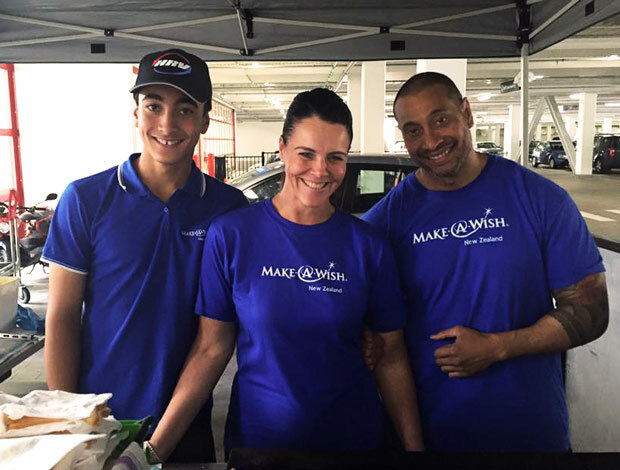 The key mission of Make-A-Wish is to grant the special wishes of children with life-threatening medical conditions to give them hope, strength and joy at a very difficult time in their lives. Some of the trips that have been made possible (by the pre-approval of the medical team at Cover-More) include theme parks in Australia, as well as trips to Europe and the USA meeting celebrities. Angus was able to fly to Sydney with his family to watch the All Blacks win the Bledisloe Cup with Cover-More travel insurance. Samuel's one true wish was to go to a Parramatta Eels game in Sydney and meet the team - Cover-More provided travel insurance for Samuel and his family. Samara wanted to go to the Gold Coast, Australia to visit a close family friend and to see the dolphins at SeaWorld Australia. Ela-Huia's wish was to go to the Theme Parks on the Gold Coast, Australia and wants to go back again next year! Ryu and his family headed to MovieWorld on the Gold Coast, Australia and hugged koalas and fed kangaroos! 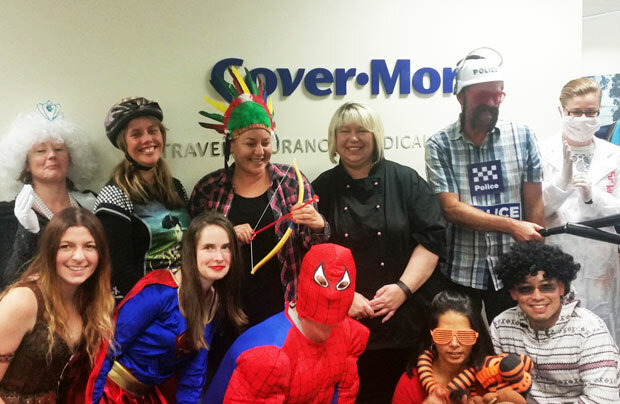 Cover-More is committed to supporting the valuable work of this phenomenal organisation and we gift travel insurance policies to children and their families each year in order to grant their wishes where overseas travel is required. Todate we have covered overseas trips for 68 wishes. If you’ve wondered why you should buy travel insurance, ask these Cover-More customers. Each of them encountered an unfortunate unexpected event that threatened their travel plans, their health, or in a few cases, even their lives. And in each case, Cover-More Travel Insurance came to the rescue. We not only provided money to cover their claims, but just as important, provided superior assistance and support. Although we are never happy when one of our customers experiences a problem on their trip, we are proud to be able to come to their aid. Anytime. Anywhere. Jean was fulfilling a long-held dream of trekking to Mount Everest Base Camp in Nepal when she injured her ankle. Cover-More came to the rescue by arranging the airlift from Mount Everest to Kathmandu and then after treatment, bringing her back home. Jules had jetted off to Indonesia for a surfing holiday when she got injured in the waves. Jules had broken her neck in two places so Cover-More stepped in to evacuate her out of a remote area via helicopter. We arranged for Jules to get the care she needed before we could safely bring her back home. Mark and Julie decided to go to India to see the Taj Mahal. Julie suffered two spinal compression fractures when the bus she was travelling on drove over a pothole on the way to visit a tiger reserve in India. To ensure our customer received the best possible medical care when he had a stroke in Rarotonga, Cook Islands. Tom Nesbitt, who was on an eight-day holiday to the Cook Islands with his wife, Mary. After arriving in Rarotonga from Auckland in the late afternoon, Tom and Mary decided to watch the All Blacks play a match on television before an early dinner and bed, so that they were ready to embrace the ﬁrst day of their holiday the following morning. Tom woke up at 5am the following morning, and as he got out of the bed and walked across their hotel room, he collapsed. Tom knew he’d had a stroke almost straight away, as he couldn’t move his left leg, arm or hand. Mary called reception to get help for Tom and he was immediately taken to Rarotonga Hospital. The medical and nursing staff at Rarotonga Hospital were wonderful, qualiﬁed, attentive and responsive, however, due to its location, the specialist care it was able to provide was restricted. As soon as Tom was admitted to the local hospital, Mary called our medical assistance team to advise us of Tom’s situation. We spoke with Mary, and Tom’s treating team, to determine his status and agree on the best course of treatment for Tom. Due to the facilities available at the hospital, we knew very quickly that we needed to get Tom out of Rarotonga to Auckland for specialist treatment. We started making arrangements for an air ambulance to ﬂy to Rarotonga to collect Tom and Mary and make the ﬂight to Auckland. Our doctor and paramedic arrived in the evening ahead of their departure with Tom and Mary at 8am the following morning. Our medical team checked Tom to ensure he was looking ‘ﬁt to ﬂy’ on the air ambulance the following morning. The next morning an ambulance transferred Tom and Mary from Rarotonga Hospital to the airport where our air ambulance, doctor and paramedic were waiting. They ﬂew to Auckland via Tonga, as the pilot had to stop to refuel. An ambulance met the plane on the tarmac at Auckland International Airport. Fortunately, Tom and Mary’s son and daughter-in-law were able to meet the ﬂight on the tarmac as well, and they followed the ambulance from the airport to Middlemore Hospital. Tom spent six nights in Middlemore Hospital where he was seen by specialists and physiotherapists. He was discharged and is now recuperating at home, together with regular medical and physio appointments. According to Tom, his doctors are very pleased with how well he is recovering from the stroke, but he’d like it to be faster.